The ladder line now comes down to ground level just outside a window to the shack. I have an upside down plastic trash bin which contains the balun and some hardware with coax connectors which are grounded to two 8 ft ground rods. A length of 6 gauge wire goes around the house to connect my antenna ground to the power utility ground rod. The three coax cables are: The ladder line (i.e., coax from the balun), my VHF vertical and a third that comes out to a single terminal. The green wires are the connections to the two ground rods which are close to the box. And here's inside the shack on the other side of the window. That's my old MFJ-941D manual tuner mounted on the wall. It looks a bit odd but it works well. I mounted it on the wall so the coax between the balun and tuner would be very short because it usually runs at high SWR. It's been quite a project. More than it looks, especially since I'm no mechanical engineer and don't have much in the way of tools. I had to do some creative rerouting of the ladder line which involved using some PVC pipe to hold it away from the roof. The ground rods went in easier than I expected. Luckily I didn't hit any rocks which are common here in New Hampshire, known as the Granite State. The angled grounding bracket came from Chris, KF7P who sells several items of metal work useful to hams at http://kf7p.com. The SO239 bulkhead connectors came from DX Engineering. An obvious question is: "Have I really provided any protection for the ladder line?". I'm not sure of the answer. It's hard to see how grounding the shield of the short piece of coax coming from the balun really achieves much. I've probably achieved more for the VHF antenna which has a long piece of coax going to a spike in the sky. At least I now have the easy option of disconnecting and grounding the ladder line if any storms are forecast. I couldn't easily do that when it was coming into the attic. I feel like I've made a reasonable effort to comply with the part of the NEC (National Electric Code) which deals with safety of cables coming into a house. 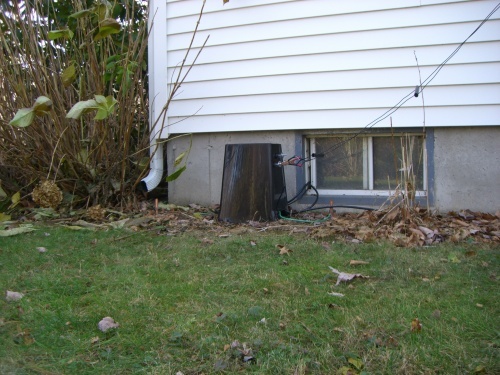 I believe the main thing it requires is grounding of coax shields before they enter the house and that ground must be bonded to the utility ground. I considered installed lightning protectors like these but decided not to. They're kind of expensive and are not required by the NEC. I guess they are useful for protecting equipment but I always disconnect the equipment when I'm not using it. I'm not sure if one of those would work on the coax to the balun anyway. Voltages on that line would be much higher than the voltage on a matched line which might cause a protection device to "fire" under normal operation. From an operational point of view, I'm very happy with it and pleased to be using a manual tuner again. I could write another post about it but both automatic tuners I own had some problems. The LDG-Z11 Pro seems to be a little unstable at times and decides to retune when it doesn't need to. Comments I've found online suggest that better grounding would help but that's not easy to do when the tuner is in the attic or up in the air. The SGC-239 had the opposite problem. It sometimes wouldn't tune when it needed to. Its SWR threshold was too high for my liking. The output power of the TS430S reduces quickly with any reflected power. Both problems can be very frustrating when you don't have direct control. I can adjust the manual tuner quickly now that I have recorded the settings and I can match it on all parts of all bands from 80 to 10 meters. I'm getting good results. 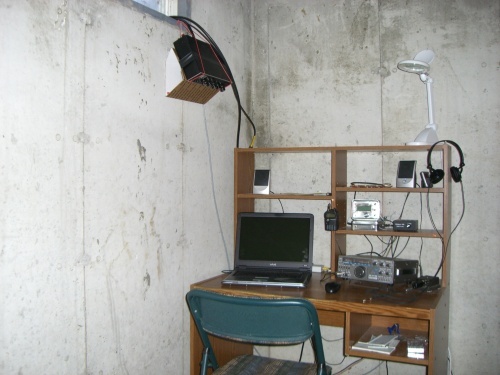 People are often surprised to hear that I'm only running modest power and a wire antenna. The third coax coming out to a single terminal is mostly an experiment for 160 meters. It's so that I can do the classic trick of joining the ladder line wires together and feeding it all against ground as a big random T shaped wire. It works and I've had a few QSOs but, not surprisingly, it picks up lots of noise from the house because the ladder line becomes part of the antenna. I probably don't have anywhere near enough metal in the ground to be efficient. It's all been good fun. I'm done with antenna work for a while and are enjoying operating on the air. Hopefully the ropes will stay in the trees over winter. I haven't been on digital modes for some time because the audio input of my old laptop computer developed a hardware fault. I have now inherited a "new" old laptop which works very well so I'm back on digital. See you on Olivia mode. 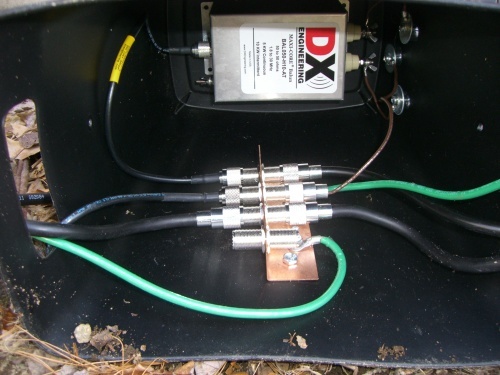 You have that current balun Correctly Grounded without bonding at that wing nut.This is from the DXE instructions.I run one on my gnd mounted vert.